Buzz Words is excited to be part of Stephen Anastasi's blog tour for not one but two books. For the list of all the other fantastic book blogs participating in the tour, see below. 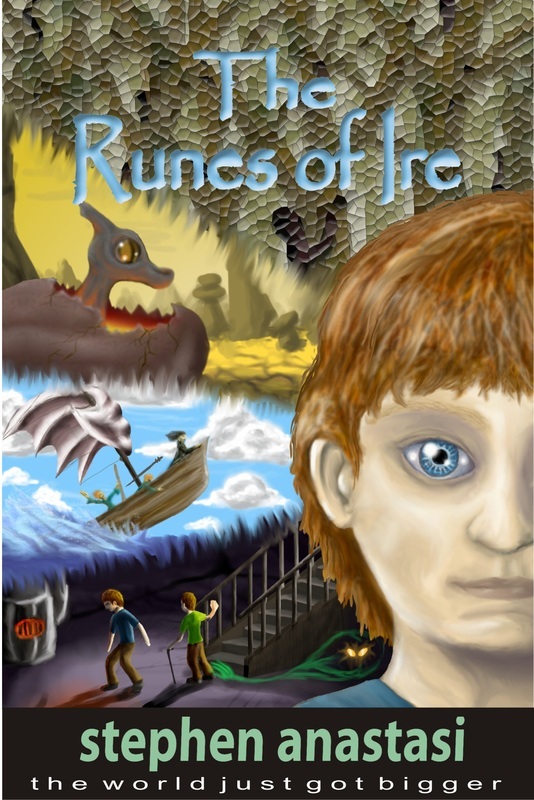 Win a copy of The Runes of Ire or The Druids. Details at the end of the post. Garney lives a life ‘out of order’. He’s a dreamer and friendless, and is always late. He loses the bus, his belongings and has lost his father. He is a victim and Thatch the bully loves to remind him of that. But it’s his twelfth birthday and something wonderful awaits him. Eldeth lives inside a deformed body. But his body does not define who he is. He grasps what he can of life to ensure that he fills what he believes is limited time, with everything he longs to do. Garney dreams of a magic potion that will straighten Eldeth’s crooked back and legs. Aunt May is an optimistic and positive person. Her conversations about special powers, focus and concentration, and the history of the Barnicoats excite the boys’ imagination. She frequently reminds them ‘that things are rarely as they seem’. But they cannot imagine what is in store for them. Their life is about to move into another dimension in more ways than one. In this dimension, Garney fits; he belongs. The boys go in search of the attic to discover treasures and secrets, but find none. Garney again proves to be smart and finds a secret passageway leading to the attic with a computer. He enters into a game that only the keeper of the Wild Magic can use which magically opens to Garney. The challenge proves that he is anything but the scatterbrain others see him as. He shows focus, concentration and problem-solving skills and wins not the expected pair of virtual reality headsets but two face masks. On wearing them, Graney and Eldeth enter a world of the fourth and a half dimension where things are not always as they appear. They embark on a wondrous adventure that demands all their combined skill, focus, concentration, inner strength and integrity. This adventure morphs into a great quest. The computer game has become their reality and this reality is surreal and dangerous. But the boys are no longer the same as when they began. Their world is now consumed by challenges, dragons, searches and family history; physical and mental tests of intelligence and courage. Their participation in the warring of good and evil in different forms reshapes the two friends. There are so many levels, themes and philosophical meanings to explore in this marvellously intelligent book; a book that aptly reflects the mind of its creator. It is true that it will be read twice, for only in the second reading will the scope of the author’s imagination be acknowledged. Titian is an orphan and wasted from work and lack of adequate food. She is a wisp of a girl cowered by life, but mostly by Cook’s cruelty. She appears weak because she’s downtrodden, but in fact has a strong mind and spirit, and is a deep-thinking and compassionate being. Myriam, another servant under Cook’s inhumane rule, has taught Titian about herb lore and through the long days tending sheep, she has cultivated a deep bond with the natural world around her. She has also learnt about the healing fragrant moss that was once abundant but which has disappeared from sight long ago. Myriam is Titian’s only source of love, learning and comfort, except for the occasional kindness from Samson, a mighty warrior of the Clan. Titian alone can see the Mystal dragons which she has come to love that flow though the mist when she sits with the sheep. These long days alone are filled with carving and shaping a staff fashioned from a fallen oak branch. The carver’s talent will lead to a shift in her life. Titian is caught with the staff by Dariad, the son of the Druid Mater who believes the girl to be the One the Druids have been seeking. The Swarthymen, the people with a sole ambition to kill and conquer, believe she is a healer and she is taken. Escaping from her captors, Titian begins an astonishing quest bound to and by the staff and the dragon carved thereon. 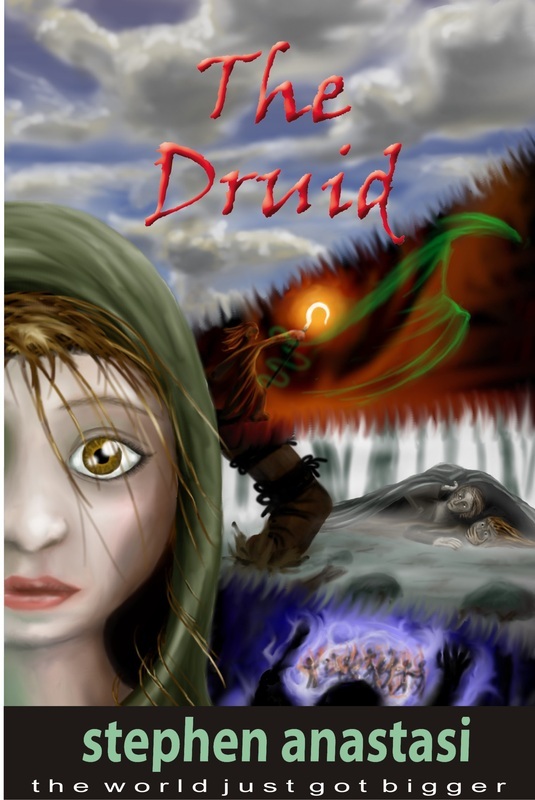 The Druid is very much a character driven fantasy novel. It is a perfectly paced, well written novel filled with shifts and changes, sub-stories and magical adventures. This is the first book in the Trilogy, The Land of the Rainbow’d Sun. The incredible cover created by Scott Anastasi is mysteriously joined to the author’s other series currently released: The Runes of Ire: Adventure One of the Mathemagicians of Yore. The two half faces of each book, one of each main character, join together to make one face. A highly inventive and eye-catching parallel. April 26th: http://bluedingo.ning.com - guest post interview. The Runes of Ire and The Druid are available from your local bookshop. They may not be in stock, but the store can order it through distributor Dennis Jones and Associates. It is also available in many on-line stores as a paperback and as an eBook, and from http://morrispublishingaustralia.com. You can win a signed copy of either book in a competition the publisher Morris Publishing Australia is running as a part of this promotional tour. One of each book is up for grabs. To go in the draw, simply go to the website by the link above and on the contact page form write: Stephen’s competition, your name, email address, and your book preference. Thanks for being kind hosts, Buzzwords. I'll try not to let your review go to my head. Without spoilers, I have seen the ending of The Land of the Rainbow'd Sun trilogy, and it is sure to slay readers and never be forgotten. It has been a pleasure, Stephen. You have me intrigued about the the ending to The Land of Rainbow'd Sun. The anticipation of upcoming books is like waiting for Christmas to arrive. I love it!